Racing at the Ranch in Camp Verde, AZ September 25 and 26, 2010 (NAFA sanctioning pending). Our third tournament--we plan for a barbecue and some fun water activities in the pond! Desert Rocks in Pahrump, NV (April 10-11, 2010), hosted by Heat Wave. Wags and Kisses in Chandler, AZ (February 13-14, 2010): Blazin K9s first tournament! Wags for Wishes multisport event in Glendale, AZ (January 2-3, 2010): Hosted by Heat Wave, a fundraiser for the Make-a-Wish Foundation. We place 2nd of 4 in Division 2 and 6th of 7 in Division 1, with a best time of 20.07. Duel in the Desert at Cynosport in Scottsdale, (November 14-15, 2009): In Multibreed, we are 2nd of 3 both days with a best time of 19.2; we end up in Championship, where we place 9th with a best time of 18.977. Fergus earns his Flyball Master Excellent title! 2008 Cynosport World Championship in Scottsdale, AZ (October 31-November 2, 2008): Three days of racing in very hot weather!! Friday, 1st of 4 in Division 3 and 2nd of 6 in Open 1. Annie makes Flyball Master! Saturday, 4th of 5 in Division 2, and Sunday, 1st of 3 in Division 2. Best time: 18.82. Rattlesnake Roundup in Blythe, CA (March 14-15, 2009): Beautiful location next to the Colorado River. Between lots of swimming and running every race, Bravo overexerts himself. In Division 1 both days, we take a 2nd of 3 and a 3rd of 3, best time 19.42. Rosa earns her Flyball Master Excellent! Desert Rocks in Pahrump, NV (April 18-19, 2009): Yeta debuts and shows her star potential, turning in a 4.6 from a standing start! We turn in a 4th and 6th of 6 in Division 1. In Multibreed we run a 19.1 with Bravo running like a sea lion. We pull him from racing, and later retire him. We placed 5th of 5 in Multibreed, and 1st of 5 in Open, with a best time of 18.46. St. George Flyball in St. George, Utah (May 2-3, 2009): A beautiful location in St. George, perfect weather, and "lite" racing make for a great weekend. Roo debuts and turns in a solid performance--another great dog for our multibreed team! We win 1st of 4 in Multibreed and 4th of 4 in Division 1. Best time: 19.69. Racing in Rim Country in Payson, AZ (May 16-17, 2009): A 1st of 5 in Open on Saturday and 2nd of 3 in Multibreed on Sunday, with a best time of 19.7. Bu earns Flyball Master! Red Rocket Blastoff in Payson, AZ (September 19-20, 2009): Hosting our second tournament, we are blasted with the most rain and hail we've ever seen in a single hour! Despite the pounding, we got in a good half-day Saturday and a full day Sunday, including human flyball. We take first in Multibreed on Saturday and second on Sunday, with a best time of 19.06. Red Rocket Blastoff in Cottonwood, AZ (October 13-14, 2007): The first time we host our own tournament! 16 teams compete and enjoy great weather and fun racing. We win 2nd of 4 in Division 2 both days, with a best time of 19.86. Bu earns her Flyball Champion title! 2007 Cynosport World Championship in Scottsdale, AZ (November 2-4, 2007): Hot, Hot, Hot. Fridayis a great day: 1st of 5 in Division 6, and Penny earns her Onyx title, and Rosa earns her Flyball Master! Saturday, despite solid racing and a time of 19.6 we are at the bottom of our 5-team bracket, and eliminated from Sunday racing. Snowbird Shootout in Buckeye, AZ (December 1-2, 2007): Wow--it really snowed (well, rained and hailed) at this Snowbird Shootout. We took 1st of 3 both days in Division 2, with a best time of 19.3.Bravo earned his Flyball Master Champion title. Petfest in Scottsdale, AZ (March 15-16, 2008): With the Wilson-Teeters joining the team, we are in Division 1 and Multibreed both days. The Westworld site crew are a nasty bunch, but the racing and flyball teams have fun nonetheless. Division 1: 2nd of 4 Saturday, 3rd of 4 Sunday, best time 19.54. Multibreed: 3rd of 3 both days, best time 19.49. 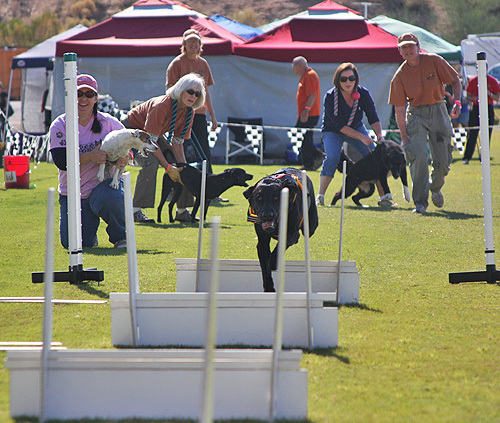 2006 World Cynosport Flyball Championship in Scottsdale, AZ (November 3-5, 2006): It was thrilling to participate in a true North American championship against teams from across the continent. On Friday we proudly take 2nd of 5 in Division 4. On Sunday, when there are no divisions, we tie with 4 other teams for 21st place. Jonas earns his Flyball Champion Silver title. I Love Flyball Tournament in Blythe, CA (February 10-11, 2007): Beautiful weather and a wonderful host team make this a fun weekend--topped off by a second and a first out of 4 in Division 3! Finn debuts and earns his Flyball Dog Excellent. Bravo earns his Flyball Master Excellent. Flying Colors Tournament in Las Vegas, Nevada. (March l7-18, 2007) Another great weekend! Warm weather and a well-organized tournament make racing a pleasure. In Division 2 both days, we take 3rd out of 6 on Saturday and 2nd out of 5 on Sunday, with a best time of 19.6. Finn earns his Flyball Champion title. We top it off with a great visit to Star Trek The Experience! Arizona Pet Expo in Phoenix, AZ (April 21, 2007): We won 1st out of three in Division 2 at this one-day spectator event. We missed our veteran Penny but the rest of the team performed professionally to keep us on track with a best time of 20.22. Racing in Rim Country Tournament in Payson, AZ (May 19-20, 2007): A beautiful site and cool weather make for great racing and a tribute to Bill Geen. In Division 2 both days, we take 3rd out of 5 on Saturday and 2nd out of 6 on Sunday, with a new best time of 19.3 seconds! Mountain Mayhem in Payson, AZ (September 14-15, 2007): A 1st and 2nd of 5 in Division 2. Best time: 20.02. Most exciting is the debut of Annie, who earns her Flyball Champion title, and Bu, who earns Flyball Excellent. Duel in the Desert Scottsdale, AZ (November 12-13, 2005): We have nowhere to go but up--5th out of 5 in Division 4! Best time: 20.384.On the bright side, Bravo earns his Flyball Master title. Rattlesnake Roundup Luke Air Force Base, AZ (February 25-26, 2006): Hot fun! 3rd out of 5 in Division 2! Best time: 20.184. Fergus earns his Flyball Master title! Stampede "Bring Back the Old Pros" Tournament St. George, Utah (March l7-19, 2006) We finally break 20 seconds with a best time of 19.736! Cold, wind, and rain add excitement and make everyone spacey. Nonetheless, we win a 2nd out of 5 on Saturday and 2nd out of 2 on Sunday in Division 2. (We're not talking about our 3rd out of 3 on Friday in the Old Pros division). Neka earns her Flyball Master title! RUFF Flying Dog Flyball Tournament near Denver, CO (June 9-11, 2006): Rosa and Jonas debut and bring us breakout times, with a new team record of 19.5 seconds. Boris and Trevor receive Junior Handler recognition. We win a 4th and a 2nd out of 5 in Division 4, 3rd out of 4 in Multibreed and have a fabulous time with great weather and beautiful scenery. Wags for Wishes multi-sport event in Del Mar, CA (July 7-9, 2006): The heat and lure coursing do us in early--not enough dogs to keep going! Demo: Coconino County Fair, Flagstaff, AZ (Labor Day weekend, 2006): An exciting demo before the rain starts pouring down! Rio Rancho Roadrunner Rally in Rio Rancho, New Mexico (September 30-October 1, 2006): A great first tournament hosted by High Desert Sundogs. Perfect weather and a beautiful setting. We win 3rd and 5th of 7 in Division 2 with a best time of 19.52. Rosa earns Flyball Champion silver and Penny finishes her Flyball Master Champion title. DEO Speedwaggin' No Frills Grand Junction, CO (September 3-4, 2005): 5th and 4th place in Division 2. We celebrate Bravo's Flyball Master title! Best time: 20.150. Our St. George multibreed team--1st place for Rosa, Penny, Annie, and Roo in May 2009. Penny would have only one more tournament before going completely blind. After two busy days of racing and a first and second place finish in Blythe, February 2007, we happily pack up to head home. Winners both days at Duel in the Desert, November 04! What fun! No, we don't get excited . . . The Del Mar Four! Four racers in Del Mar on 4/4/04. Only the second tournament for Neka and Bravo, who performed like vets. Thanks to Reta's generosity in taking on boxloading duty, we had a great time and great racing! You gotta love these outdoor tourneys and their doggy dunking tanks! How many Rockets can fit in a wading pool?